I feel so angry, sad and confused right now that I’m not even sure I should be writing. But maybe writing through these feelings will help me make sense of them, because at this moment, there is so much that makes so little sense. Back in July, I wrote about a childhood friend that suffered a massive heart attack and slipped into a coma. Despite all medical efforts, healing thoughts and prayers, the damage to Maureen’s heart and brain was too great. She passed away Sunday morning. She was 40 years old. Maureen leaves behind her husband, Mark, her five-year old daughter, Natalie, her lifelong best friend, MaryBeth, and a host of friends, family, neighbors and colleagues. The knee jerk reaction to this sudden, unexpected loss is to ask why. Why does a wonderfully loving wife, Mom and friend die this young, this tragically? We try so hard to figure it out. We cry; we yell; we shake our fists at the sky. Maybe the space between life and death is only as wide as a strand of hair after all. Every moment of every day, there are near misses: semi trucks that just miss plowing into cars packed with kids, falling glasses caught seconds before smashing to bits, blood that slows almost to stillness and suddenly finds its flow. Maureen: It’s not so many years ago that we were playing kickball and hopscotch. 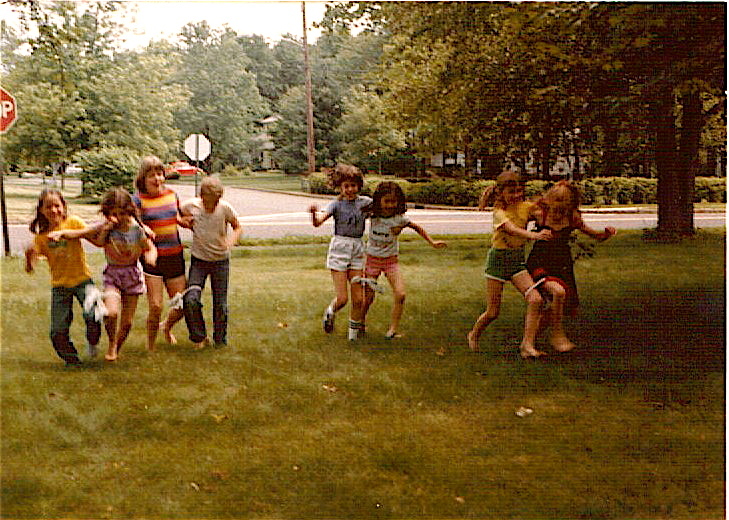 We don’t have to dig back far in our memories to remember days spent running three-legged races across each other’s yards. It’s easy to hear your voice in my head. I think of Natalie, age five. At five, our parents are magical beings, capable of great feats: keeping us safe from real and imagined harm, carrying us high on shoulders, sending us off to sleep, molding the way we experience the world. Perhaps there is no reason in any of it. No lining up of facts. No theories to prove. Life and death exist side by side, because one simply cannot exist without the other. This is when it hurts. This is why the ancient Aleutians bound tightly the limbs of the bereaved. Without it, they feared those in grief would, literally, fall apart. Or so said Annie Dillard in her novel. I can’t leave it like this. If there is sadness and anger, it must also mean that happiness and joy eventually follow. So I go back to basics. Back to girls with legs bound together, arms linked, running and laughing hard, leaning on one another. We always want to assign meaning to events in life…I am not certain that we can do that…I am sorry for the loss of your friend and her family’s loss…peace be with you and them. I’m not certain either. Thanks so much for your kind words and thoughts. That was very beautiful… just like Maureen. Thank you, Sharon. May Maureen, her family, friends and you find peace. There’s never an explanation for something this sudden and senseless. I will keep Maureen’s people in my thoughts. Beautiful and very sad. I’m so sorry for everyone she loved and who loves her. Thanks for the sweet words, my friend. Thinking about you. When things like that happen, we are left to wonder why. I’m not sure we capable of ever understanding the why. It’s a good lesson to hold on tight to the ones we love. Thanks, Em. I’m not sure we’re really capable of knowing the “why” either. Or, if there even is a “why.” But I agree, it’s worth loving the best way we can.